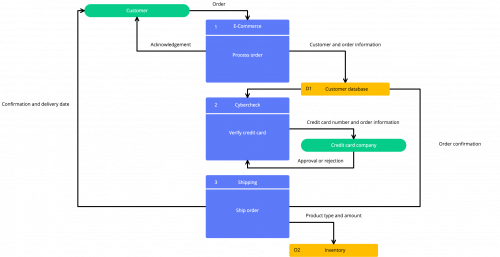 While the processes that flowcharts visualize require a lot of creative problem-solving to create, flowcharts themselves are formulaic. Taking creative liberties should be saved for other design projects. The foundations of flowchart design are set in stone at this point. Always format your flow from left to right or top to bottom. 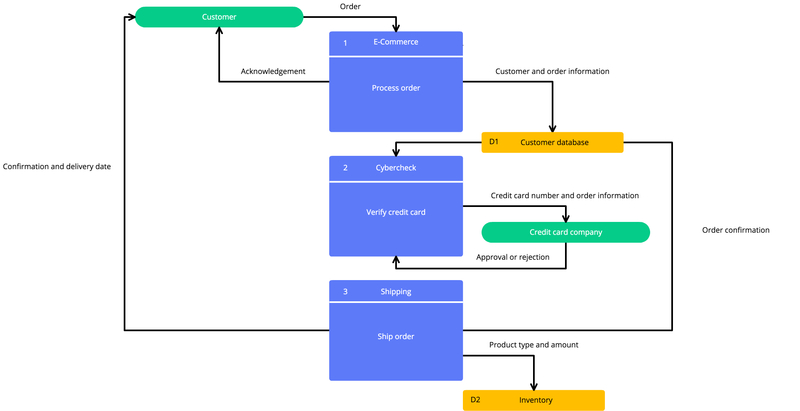 Run your return lines under your flowchart, making sure that they don’t overlap. Maintain consistent spacing between symbols. Other rules are more flexible. In the case of capitalization, the opinion is changing. Banning all caps was once standard. However, today, many high-quality flowcharts have found ways to use all caps without occupying too much space. When it comes to length, give your flowchart the resume treatment: keep it to one page. People get lost jumping between pages, rendering your flowchart unreadable. If you find your chart exceeding one page, and you can’t edit any further, break it into multiple charts—each chart also sticking to the one-page rule. Re-reading it out loud. Deleting redundant words or finding shorter synonyms can save you valuable lines that add up when you’re in need of a little more space. Resizing your diagram. Keep in mind your image’s resolution. Don’t go so small that the font becomes blurry or illegible. Playing with fonts. Some business standard fonts are larger than others. Font size also comes into play. Consider scaling that 16 font down to a 14. Above all else, remember to keep your formatting changes consistent. If not, your flowcharts are sure to look unprofessional and disorganized. Minimalist designs make errors much easier to catch, which is great for proofing your flowchart but not so great if you forget to resize one of your flowchart shapes to match the rest. Take the time to review each element of your work thoroughly, from design to grammar. Double-check that you’re using the right symbols. Check for consistent fonts and colors. Take a few steps back from your screen, and see if anything stands out that you didn’t notice close up. These may seem like obvious steps, but you’d be surprised at how many simple errors slip through the cracks. Strive for polished consistency every time. Don’t get us wrong, creative designers: your work is vital to countless projects. However, when it comes to flowcharts, your creativity needs to be a bit more Frank Stella and a little less Basquiat. In short, keep in minimal. A flowchart, first and foremost, should clearly demonstrate a flow, like a team hierarchy, operational procedure, or workflow. Their functional purpose is to help people understand how something works. If the page’s ornate design delights the eye but confuses the viewer, you’ve gone too far. Because the formatting for flowcharts is so structured, most of the design choices will come down to colors, fonts, and lines. And a lot of creativity can still go into these! When used effectively, colors can help highlight key elements. You can use color to delineate responsibilities or highlight import areas. Just don’t go overboard. A simplistic palette is a strong choice when it comes to flowcharts. Much like the evolution of using all caps, some design elements have become more flexible over time. The decision symbol, traditionally represented by a diamond symbol, is now sometimes represented with a split-path symbol. 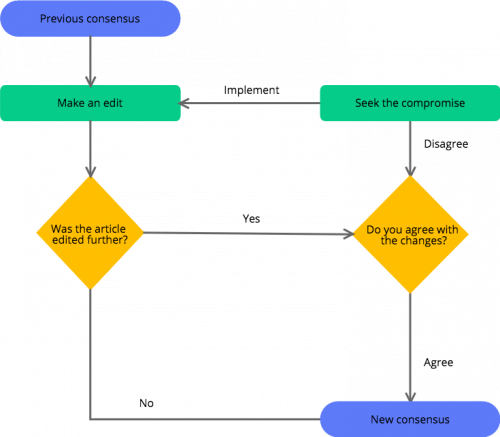 Some feel that the diamond symbol is less known to readers, and can make the flowchart confusing if it breaks the left-to-right text format we mentioned. 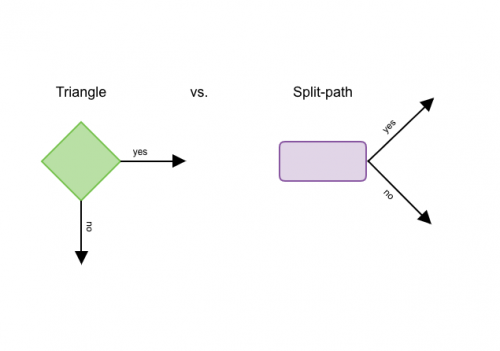 Instead of dividing at a 90-degree angle as the diamond symbol does, split paths use a forked approach that eliminates the possibility of breaking the standard reading format. Opinions vary, so choose what works best for your chart. Whatever you choose, remember to include a legend with your flowchart. As options and opinions vary, providing a key ensures that your readers always understand your work. These may not be the most complex art decisions you make, but they can impact your flowcharts readability significantly. Creating a flowchart isn’t as easy as it may seem. But all it takes an eye for detail and a basic understanding of a few industry standards to get started. Templates can also help speed up the process. With these helpful tips, you’ll be on your way to creating functional and beautiful flowchart diagrams for your team.